Christmas is nudging its way into my mind these past few days. usual on Pinterest. Are you doing that too? I thought I'd share a few Christmas Pinterest boards that are making my eyes sparkle. Pictures of homes that are decked out in realistic ways are what I like to see. As my friend Kim at Exquisitely Unremarkable talked about, I want to decorate using the things we already have and love but with a little Christmas twist. Grab a cup of coffee or a big Diet Coke and enjoy a few of these Pinterest boards. This is Andrea's kitchen at Opulent Cottage. 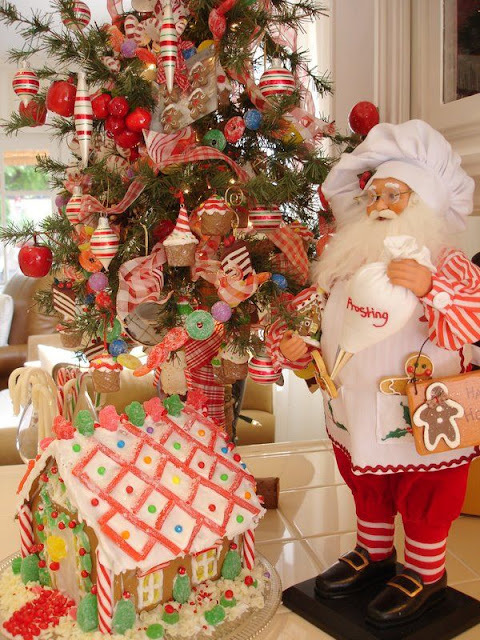 This picture is posted on Jeanne's Christmas Kitchen Pinterest board. 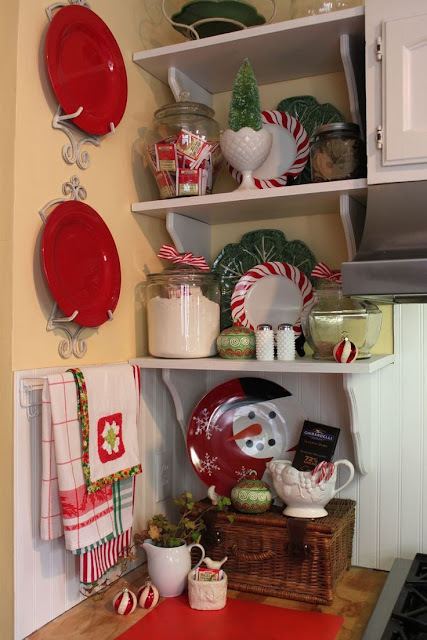 Andrea put her cute Christmas dishes on the shelves that she changes for the seasons...tied a few ribbons...and just look at how adorable it is! Love this picture posted on my Pinterest board. How easy and cute is this? and then add the perfect embellishment. one pinned from Around R House. Adorable! And of course sweet Carol at Art and Sand inspires everyone with her creative cottage blog. Just adding red changes a room from the everyday to HOLIDAY. Amazing how just the use of one color sparks the imagination to see Christmas. Love the plates and the santa is fabulous. Great inspiration. Pinterest is a real time killer isn't it? LOL I get on there and three hours layer I come to. So many creative ideas. 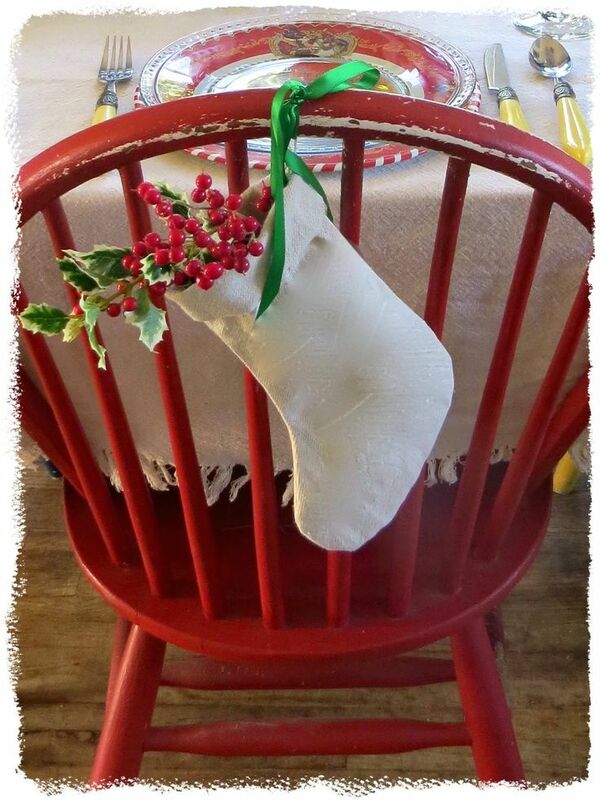 Oh I love that little stocking hanging on the chair! I'm trying to keep my decorating more simple too and just embellish the things I already have around. I just got an email from Carol about their Christmas plans! I love all of this inspiration. I just discovered that the holiday channels are back on my satellite radio. That's all it takes to start thinking about Christmas. After seeing these pretty pictures, I'm now inspired even more. I've only recently started to "pin" and try to limit my time with it as I know I could easily waste hours drooling over all of the inspiration to be found there. That stocking on the back of the chair is adorable! I love to decorate the kitchen and dining room the most. So many fun ideas here! I am beyond excited to decorate my house for Christmas!! Thanks for these easy and lovely ideas! Those are all such great pics for Christmas inspiration. I can't believe it will be time to decorate in just 2 weeks! Well, what a surprise, to see my name here today, Stacey! :) Thank you for the sweet shout out. I too have listened to a random carol or two lately. I don't know why, but I'm feeling a little teeny tiny bit nostalgic and Nat King Cole is hitting the spot. Of course, it doesn't hurt that my kids have put lights up in their rooms already! lots of cute ideas...but the simple white stocking with greenery appeals to me! Simple. Cute. I sent you a couple of emails. Yes, I'd love to be a part. Let me know the details. I love Pinterest for inspiration. The red is gorgeous. Yep, I'm doing the same thing - looking at Christmas and getting ideas! I could spend all day long on Pinterest! That site is addicting to me! My eye went to that pretty gingerbread house. We use to make houses like that every year, but like everything, times change. Pinterest is dangerous this time of year (or any time I suppose!). Hi Stacey, lots of great inspiration here. Love Carol's boards and all Pinterest has to offer. Getting ready for decorating here. All the tubs are down from the attic. Such great ideas and I love inspiration that you use what you have in the decor theme. Thanks for sharing these Stacey. Have a wonderful week ahead. So pretty! I am full on Christmas right now and loving every bit of it! 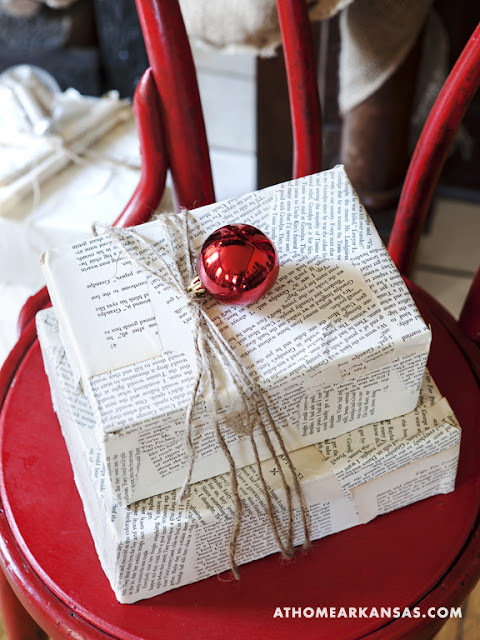 I love using red at Christmas and all of these inspiration photos are beautiful! Love the idea of using what you have. Thanks so much, Stacey...I love the gift wrapping idea!! Great ideas ~ thanks for sharing! I love it when decorations are "using what you have" rather than spending a ton of money. Although there are stunning homes decorated to the max, all of that lives in the attic, basement or closet most of the year. Thank you for leaving a message. I love hearing from you. Easter and a BIG Surprise!! PMT March/April Favorites + RESTOCK ALERTS!